Hunter Douglas Heartfelt™ products bridges the gap by adding soft texture to linear ceiling planes. 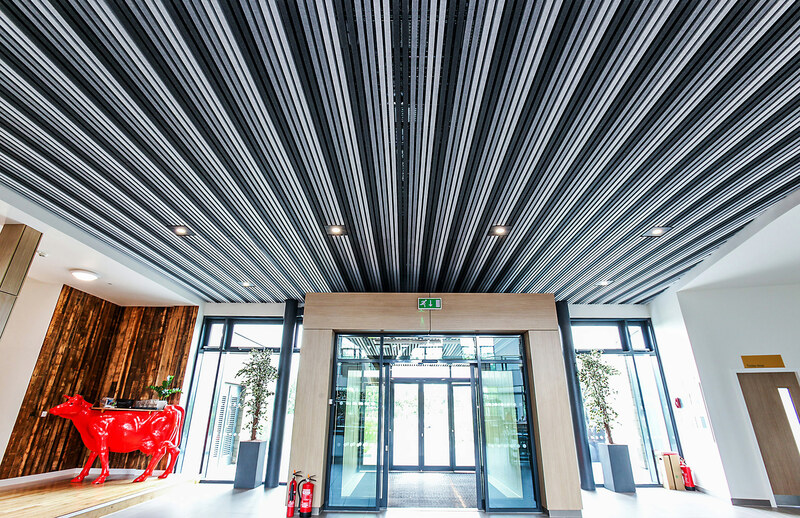 This modular ceiling system is made up of polyester felt proving to be both visually and acoustically pleasing. Heartfelt™ ceiling systmes are compatible with industry standard lighting, HVAC, speaker, fire safety and security services. Recepient of the Red Dot Award 2017 Best of the Best, GREENGUARD Gold Certified, and Cradle to Cradle Certified Bronze. Available in five shades of grey, made up of blending white and black felt fibers and is resistent to fading. HeartFelt™ ceiling panels are ideal for interior applications and can create a visual gradient on the ceiling plane.